My Magic Lilly (sometimes called a Rain Lily) made its always brief appearance. 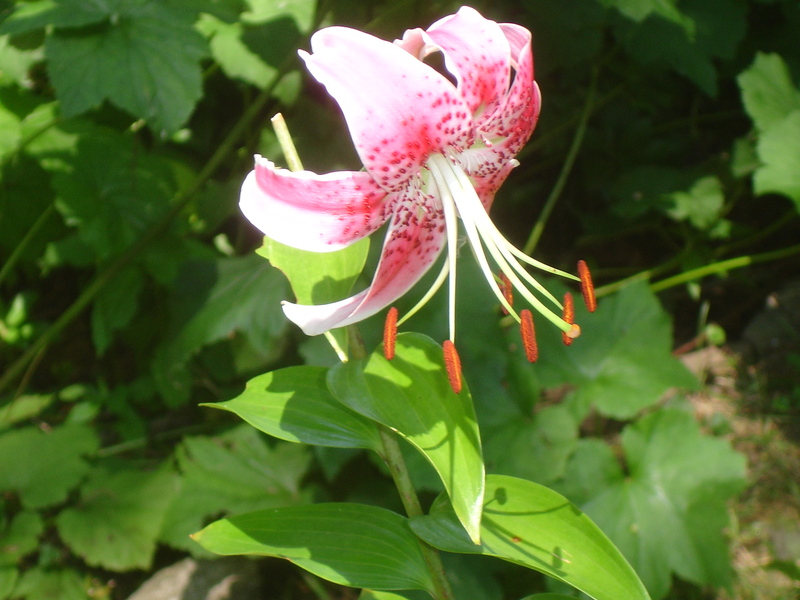 The reason it's called a Magic Lily is that its leaves appear in Spring and then disappear without a trace. 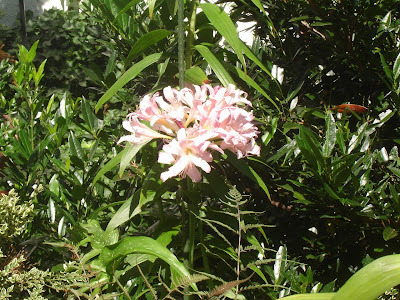 It’s easy to forget about it until the flower stalk suddenly appears as if by magic. It is also peak season for Rudbeckia Herbstone. It’s so easy to grow, some folks consider it a weed, but those fresh lemon yellow flowers which bloom for about a 5-6 week period (unusually long for a perennial) blend well with my usually abundant phlox. 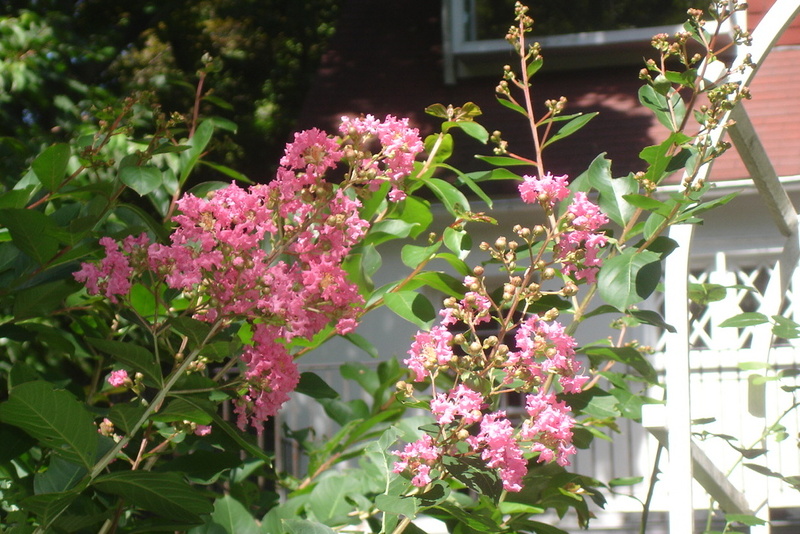 And then my crape myrtle finally bloomed. I think it’s the last crape myrtle in the Delaware valley to bloom. Probably the reason it’s so late is that we cut it way back each year to control for size. Earlier this year I was beginning to regret planting so many shrubs and trees—I had less and less room for perennials. 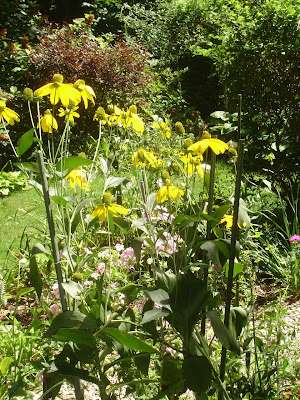 But after this year with many of my perennials eaten by garden predators, I think I made the right decision. 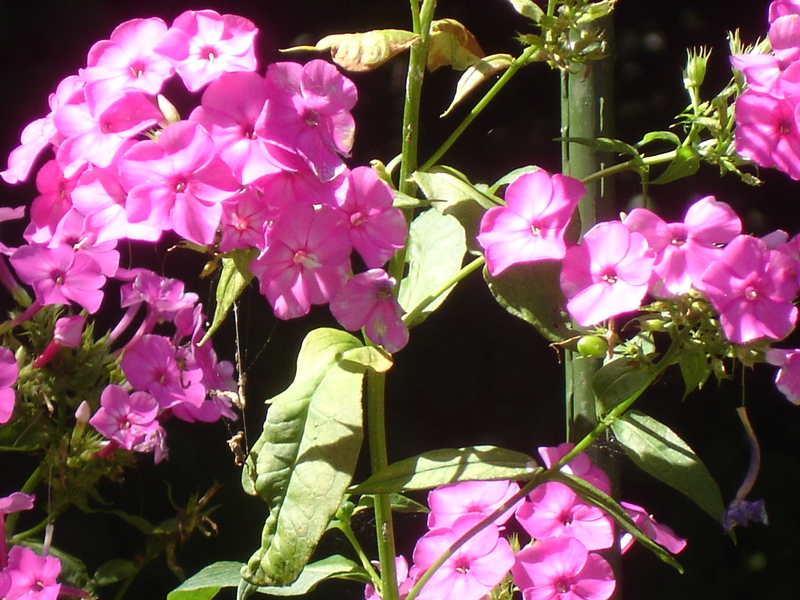 A deer or groundhog can easily lay waste to a bed of phlox but they can't do that kind of total damage to a woody plant—at least it hasn’t happened yet to my shrubs! Last Spring the New York Times lamented – in the Fashion & Style section – that the women's movement had not found another Gloria Steinem, one dynamic leader to be the “voice of feminism.” This reflects the media's hangups more than any problem in the women's movement. Women are half the population; there are bound to be multiple leaders, just as there are multiple feminist issues. So it was a breath of fresh air to read Karen Bojar's Feminism in Philadelphia: The Glory Years, 1968-1962, a lively account of the Philadelphia chapter of the National Organization for Women. 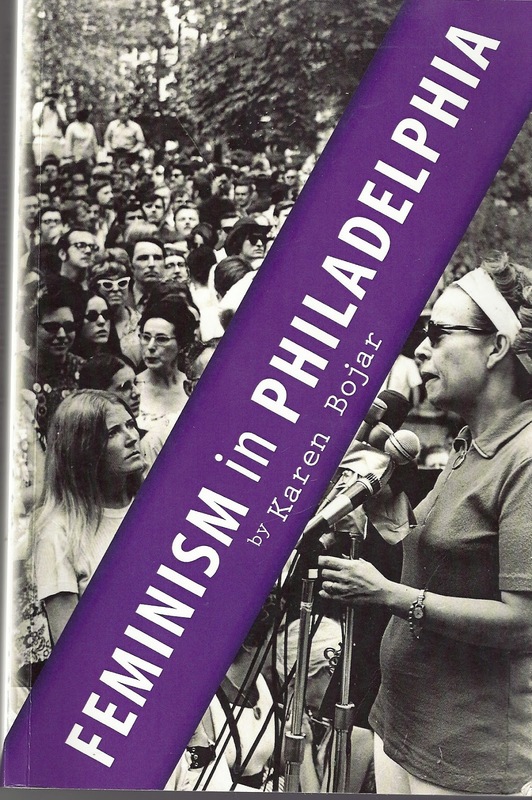 Bojar traces the chapter's history from its unlikely founding in 1967 by Ernesta Drinker Ballard, a socially prominent, wealthy Republican and lifelong feminist, through the campaign for abortion rights and workplace equality, and against racial and gender discrimination, to the eventual defeat of the Equal Rights Amendment in 1982. Bojar's engaging book brings the movement home, outlining the development of Philadelphia NOW and its interaction with the Pennsylvania state chapter and national NOW. She offers a glimpse into the day to day struggle of many committed feminists over time who have worked continuously to improve the status of women, in Philadelphia and beyond. The movement is made up of these women; they are the boots on the ground, then as now. The critique that NOW is a primarily middle class white woman's organization – a charge Steinem's face on the movement reinforced, but one she herself has worked tirelessly to debunk – has “more than a grain of truth” according to Bojar, but she shows how grappling with the intersection of racism, poverty, and sexism played out in Philadelphia and Pennsylvania as women of color joined NOW and assumed leadership roles within it. Jocelyn Morris, originally a member of Philadelphia NOW, convened Germantown NOW to specifically tackle the issues of racism and sexism and to include women of color in the local movement. Pennsylvania NOW made combatting racism a top priority during the late 1970s, and Morris went on to serve on the national NOW board and the national Combatting Racism committee. Bojar admits that the hierarchical structure of NOW is sometimes seen as a drawback to young feminists, but she argues persuasively for NOW's multi-issue approach as well as its system of local, state, and national groups which parallels the US political system. While young feminists are essential to sustained progress, Bojar believes “A revitalized feminist-led labor movement is essential to addressing the needs of women trapped in low-wage jobs...” Indeed, NOW has increasingly turned its attention to economic empowerment issues. In recounting the backlash against Roe v. Wade, Bojar reminds readers just how long ago were begun the battles being fought today. Due to the current, relentless “war on women” it's easy to despair, and feel that women's rights have taken a huge step backwards, and they have. But Bojar's history reminds feminists of all the progress that's been made through the years by an army of sisters of all ages, ethnicities, classes, and sexual orientation living and working all over the country. It reminds us that our history, like our fate, is inextricably bound together through the actions we take collectively to reach equality. The stories of battles fought and won in our own communities, naturally led by different people at different times, are the true stories of the movement. This is the way movements progress, and there is ample room for many leaders, as Feminism in Philadelphia illustrates. This is not how my garden usually looks in August—-lush, green, incredibly over-grown. 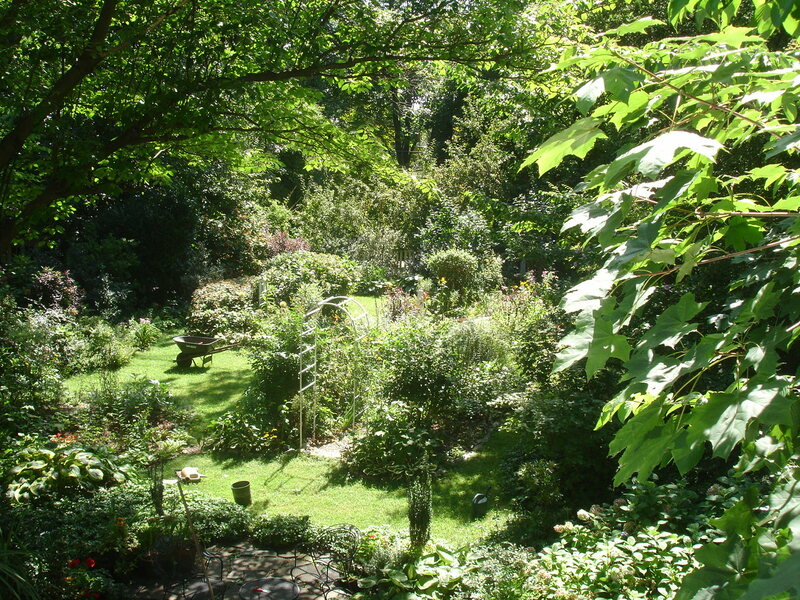 Usually, at this time of the year, the grass is turning brown and the exuberant growth of early spring and summer is a thing of the past. This year thanks to the abundant rainfall, I have not once used my garden hose. 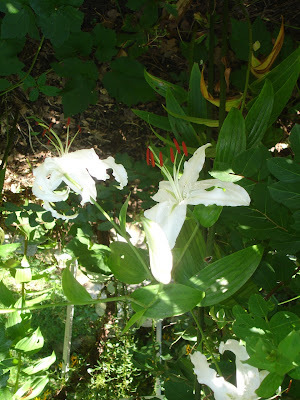 True, I had to bring out the watering can for the plants in pots, but it's been wonderful not to have to lug that hose around.